Karl and I were up at 3am and quickly did the final packing of the bikes before checking out of the Ibis Wellington NZ and getting a witness statement from the concierge while we were at it. Then I managed to get a little bit lost leading the 400m to the fuel/start location. Karl was very sympathetic, NOT! With full tanks, a quick snack and a stat docket at the 24 hr Z Servo we were on our way towards Upper Hutt, retracing the first part of yesterday’s reconnaissance ride but this time in the dark. The mountainous, winding Rimutakas were an entirely different experience at night. The lights on the F800’s were great in a straight line but not sufficient around sharp corners. We took it easy, made no mistakes but it was heart in your mouth stuff. We grabbed an ATM docket at Masterton to prove our route and we were quickly on our way to Waipara for our first fuel up for the day. We’d determined we had about 320-340kms of safe fuel range on the bikes, this was well within that. On the first section we had had some minor showers and there was a bit of mist about but prior to our next planned stop, Gisborne, it started to rain solidly. With the rain also came intermittent but strong winds that were to be a secondary but relatively constant feature of the weather for the whole day. However at that time we were still dry and comfortable and pretty close to our ride plan schedule. From Gisborne we rode to Opotiki through the Waioeka Gorge. The rain and mist was as relentless as the corners on this leg as the road mimicked the path of a beautiful white water river flowing through the gorge. The traffic was relatively heavy, lots of trucks, and visibility very low. By the time we reached Te Puke for out next fuel stop/break we were behind schedule. For the first time ever the KLIM suit couldn’t hold out the watery assault. Karl and I had a chat over a pie and warming coffee while creating large puddles on the service station floor while the attendant happily circled us with a mop. 770k’s in it wasn’t much fun. In a later discussion it came out we were looking for signs in each other that it was time to bail out (pun intended). However both Karl and I are optimists so it could only get better, right? Wrong. We then rode northwest through Tauranga, Waihi, Paeroa which all easy to type but no way we can say these names. The drenching continued, traffic levels increased but miraculously were were able to maintain some semblance of our planned OA on that leg. As an afterthought, if we were to do this ride again we’d probably go from just south of Tauranga through Matamata following the 27 to miss some of the towns. It’s slightly longer but quicker; the traffic we encountered on our shorter route was a bit of an issue. There wasn’t much to look at in this area but a bit of coastline. Or if there was we didn’t see it through the rain. At the end of State Highway 2 we hit the Waikato Expressway and turned north to the Service Centre at Bombay for fuel and a corner docket. This was our planned bail out point for the ride if we were at a point we needed to head directly to Wellington in time to catch the ferry. We were still more than half an hour behind our schedule, absolutely soaked through and cold. Hindsight is a great thing but bailing wasn’t discussed in the complete silence of that stop. We got fuel, got our damp receipts, recorded the stop, got back on the bikes and kept going. We’d been riding in the rain for 700kms, optimism was gone, replaced by determination. The traffic heading south towards Hamilton at that time of day was horrendous but we weren’t in it for too long. Turning right towards Ngaruawahia (try and say that one!) 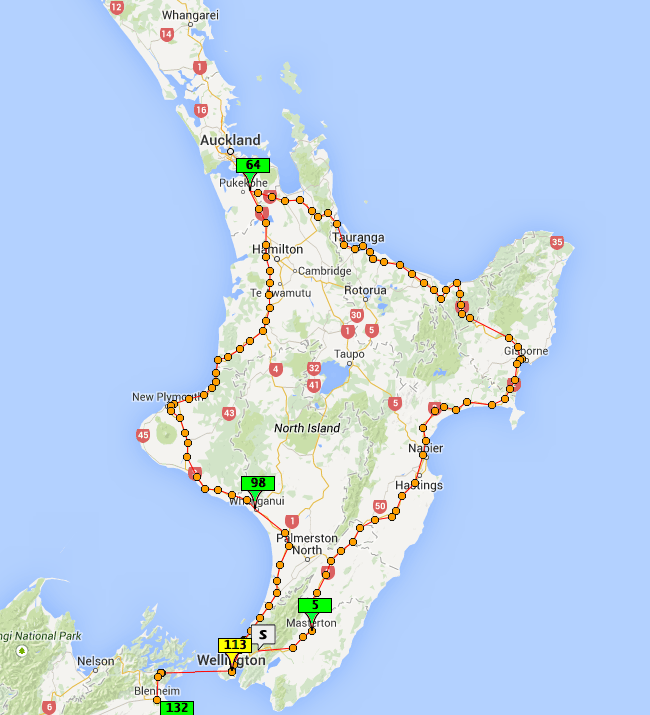 and following a clearly marked route to Otorohanga the roads and the beautiful scenery took over for a while. The original plan was to refuel at Te Kuiti but experience with the bikes during the day told us we’d be good to New Plymouth so we saved that stop time. During this part of the trip we saw one piece of blue sky and the constant rain was replaced by almost constant showers. Things were looking up as we travelled some marvellous scenic roads towards the west coast in light traffic. The coastal stretch along Mokau Road, Taranaki is gobsmackingly beautiful. Just before the little town on Ahititi I was following Karl around a left hander and his bike went down on the exit of the corner. I saw Karl hit the road, rolled and slid, his bike was thankfully sliding in front of him. On the brakes I avoided Karl but his bike was sliding across my path. Then it flipped into the air and panniers and plastics exploded everywhere. I managed to miss it all and thankfully the three or so cars that were following us along the road all stopped in time as well. Although one did get a punctured tyre from running over something. I parked the bike on the shoulder of the wrong side of the road and walked back to Karl past his wrecked bike, the engine still running. Karl was sitting up. He looked at me, looked at the bike, I knew what he was thinking. “The bike is fu^ked Karl, don’t even think about it. Are you OK?” He got up, clearly in some pain, checked himself out. He looked at the bike just to make sure my sure my assessment of it’s level of f&^%kedness was correct. Karl, an ambo himself, determined he didn’t need an ambulance or any immediate medical treatment. So what to do next? The area is relatively remote, there was no phone reception. One of the people in a car that was following us, Noel, started picking the panniers and other stuff up from the road and loading it into his car. No matter what Noel was going to take Karl to New Plymouth in his car and look after him there. Noel also spoke to some residents of a nearby farmhouse who agreed to store the bike until the hire company retrieved it. Noel also told us there was an airport at New Plymouth so then we determined a plan of sorts. Karl was going to try to make his way to Christchurch and our flight home. I was going to try to make Wellington and the ferry so I could get my bike back on to the South Island and meet Karl in Christchurch. The ride itself was unimportant now. After refuelling at New Plymouth I continued to Wanganui through the last of the daylight for some more fuel and a much needed warm drink. The rain had eased up and I even saw some dry road which was very welcome after riding over 1200kms of wet ones. In the meantime Noel had sorted out a motel room for Karl, delivered him there and offered him a lift to the airport in the morning. Noel is a legend and we can’t express our gratitude enough! During the last leg of the ride I knew the timing would be close. The original plan saw us arrive at the docks around 12am to get early access to the ferry and our cabin. The cutoff was 1.30am and with my GPS now completely flat I had no idea what my expected arrival time was. I was just trying to calculate where I sat working on the OA the Etrex was supplying and the total calculated distance of the ride. Despite the conditions and circumstances I was feeling pretty good physically and mentally. Perhaps it was because this was my fourth 1600+ K ride in a month. I was stopped for Random Breath Testing in the rain in one of the small towns I rode through and about 30k’s out of Wellington I was held up for over 7 minutes I didn’t have to spare by some night mowing of a verge. The clock was ticking down much faster than I was comfortable with. As I approached Wellington the rain returned. I reached the city proper about 12 minutes to spare and missed the turn into the city centre we’d planned the day before. I stumbled around the inner city until I saw a bank I recognized, reoriented and made it to the ferry wharf with a few minutes to spare. One car came in immediately behind me and then they closed the checkin. Phew! Cars, trucks, camper vans, another bike and I were lined up waiting to get onboard. I was standing in the rain soaked through with my gloves and helmet still on. I was processing the day’s events and not really caring that reaching the ferry meant I’d completed the SS1600K. I didn’t have time to get a receipt on the way in as originally planned and at the time didn’t particularly care. A nice guy who was travelling in a campervan started chatting to me, made an obvious comment about the weather and asked where I’d been today. His enthusiasm and interest was refreshing so I asked him to sign a witness form. He took it to his campervan and he and his wife completed it for me. A local, Gordon, on his first ride on his brand new BMW 1200GS came over for a chat. He was still wearing his helmet and all his wets too but had spent the afternoon nice and dry in the nearby Backpackers. The ferry started to load and after about 25 minutes we were told to ride on. With the bike secured I went to the cafeteria on the boat, bought a packet of chips, a drink and got a receipt. I sat for a while chatting with Gordon then retired to the cabin for a couple of hours sleep, still processing the day and wondering how Karl was getting on. Our planned OA for the ride was about 85kph. With the weather and mishaps I managed around 78kph. In good weather with very efficient stops 85 would probably be achievable meaning, on the North Island at least, an SS2000K might just be on the cards. In the absence of the foul weather and Karl’s off, our two Island in two days plan is also possible.